Want to meet new people from Steinhardt? Want to taste some food from around the world? Want to learn more about IPAC and how to join? Come to our kickoff event: Global Greet & Eat on Tuesday, September 19th between 4:00 and 7:00 PM at Pless Hall 3rd floor student lounge!! The Steinhardt IPAC is for globally minded undergraduate and graduate students to connect around ideas of intercultural exchange, international diversity, and being involved in student activities. 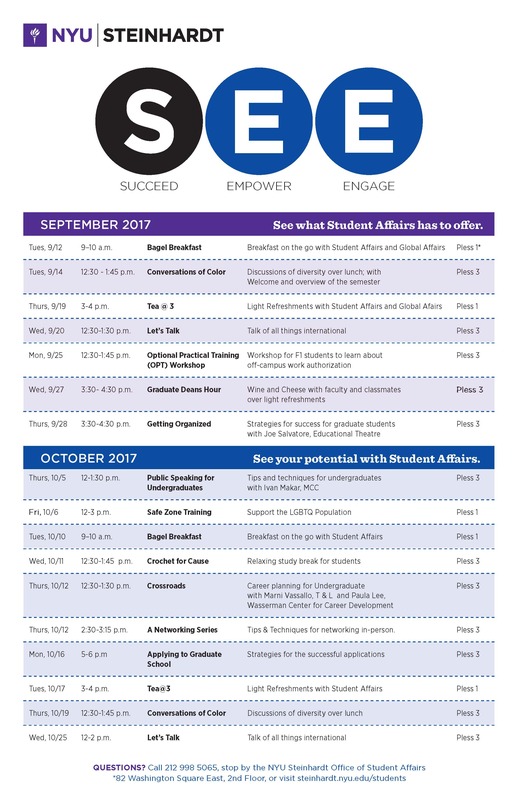 The Office of Student Affairs wants you to SEE the programming available to you. Tuesday, September 12 at 9 am – until the bagels are gone. Learn more about Conversations of Color at the Welcome Reception on Thursday, September 14th from 12:30 PM – 1:45 PM in the 3rd Floor Lounge of Pless Hall, 82 Washington Square East. Representatives from the Boren Awards will be visiting NYU to host an information session on Tuesday, September 12 from 3:30 pm – 4:30 pm at 12 Washington Place. The session is open to all NYU graduate students. If you are interested in attending, please email abby.williams@nyu.edu to RSVP. The Boren Awards provide undergraduate and graduate students with a unique opportunity to fund long-term, language-focused study and research abroad, and to launch careers in international affairs with the federal government. The deadline to submit an application is January 30, 2018. Speaking Freely offers sessions in Arabic, Czech, Dutch, French, Greek (Modern), Hebrew, Hindi, Italian, Korean, Mandarin, Russian, and Spanish. It’s all free and easy. Meet new people and have fun. It’s the perfect way to try out a language and culture before you study or visit. Speaking Freely classes begin the week on September 18th and conclude December 4th.